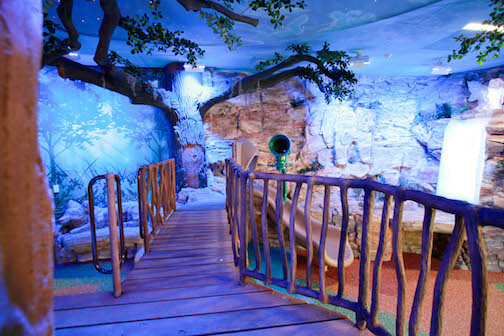 "Some children's hospitals have a train room, or a giant teddy bear at the door but none that I know of have anything quite like 'The Enchanted Forest'", said Dennece Knight. "These amenities all serve the same purpose...to make the Children's Hospital a special place for kids. Not just any kids...sick kids." El Paso Sports Commission CEO, Brian Kennedy, said that anyone who buys a ticket through Ticketmaster at the El Paso Coliseum helps support the Enchanted Forest. 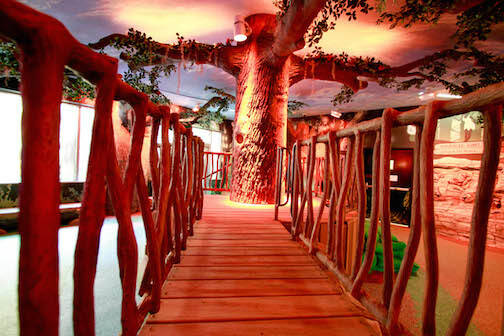 Located in the shared lobby of El Paso Children's and University Medical Center of El Paso, the Enchanted Forest actually serves patient's families and their visitors for both hospitals. "The hospital has already served one in ten El Paso Children. The Enchanted Forest officially made a visit to the Children's Hospital is a little less scary," said Knight. "The lights change every 20 minutes from day to night and the sounds of the forest change too. "Birds tweet, crickets chirp and, occassionally, an elk bugles." " It has been a blessing. You can't walk by without seeing family members visiting while the kids crawl through logs, cross bridges and enjoy a magical environment," said Knight. "Some of these families are dealing with life and death issues. But for a moment they can rest and play. This just would not have have been possible without the El Paso Sports Commission. We are very grateful."